“What counts is not necessarily the size of the dog in the fight – it’s the size of the fight in the dog.” Do you remember who said those famous words? Or when? For some (like yours truly), you may not have been born yet. Others of you probably remember it like it was yesterday. The year was 1958, and the quote was said by current President of the United States Dwight D. Eisenhower. What does that have to do with what I’m going to talk about this week? It has to do with so much that I am not even sure exactly where to start. 1958 was a game-changing year for the special needs population in Howard County. That was the year a group of parents got together and opened a school for their children with special needs. Those children weren’t accepted in traditional school, so these parents had been homeschooling until this point. It wasn’t called Bona Vista Programs back then, though. The official name of the school was the “School for the Mentally Retarded.” Makes me shudder now, but those were different times. We’ve come a long way. The school opened with 32 students in a converted house on West Walnut Street in Kokomo. It was funded, in part, by the United Fund (now the United Way) at a rate of 4.8 cents for every dollar they raised. Going through the history of our organization has been fascinating to me. I’m sure I will overwhelm you with facts and random tidbits throughout the year, but I feel like it’s always good to know where you’ve come from in order to see how far you’ve actually come! 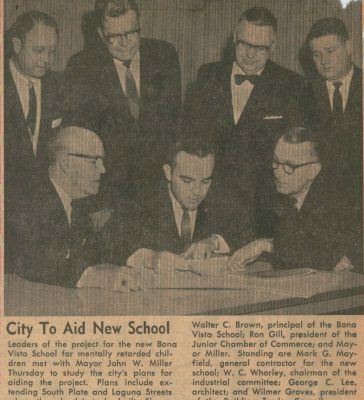 In the years that followed, the organization developed a bus system for the students, started holding public parent support group meetings, opened the first workshop to allow for employment of those served, changed the name to Bona Vista, expanded Plate and Laguna streets (Thanks to then City of Kokomo Mayor John W. Miller) to construct a new building and so much more. All of that was before 1963. Construction on our current Laguna St. location started in 1964, which (once complete) would serve as the organizations only location. It was a project taken on by the Kokomo Jaycees. But, did you know that the building was actually constructed by volunteers? It’s true! The project took longer than expected to complete because all of the work was done by volunteers and skilled tradesmen in their spare time (thank you Carpenters Union)! Talk about amazing community partners! Money and supplies for the project were donated by clubs, organizations and individuals to the tune of approximately $25,000 (they even went door-to-door collecting donations to raise enough funds). That’s right. Hardworking people who had a vision mustered up all of the fight inside them and took it out in to the community because they saw a need, and didn’t back down until it was fulfilled. The size of their fight. That’s what eventually completed this building. Their blood, sweat, tears, grit and fight. The three-classroom building with a workshop was finally all ours, and it still stands (with some modifications and additions) to this very day. Thankful. Grateful. Monumental. Foundational. There are not enough words to describe what an amazing jumpstart to this organization that had to have been back then. It just goes to show you that when a few people with a passion get together, anything is possible! Even if I wrote a separate article each week focusing on one year of our organization, I would run out of weeks before the end of the year because WE ARE TURNING 60 this year! There’s a lot to be said about a non-profit who has been around for 60 years in a community our size, and we are so proud of that accomplishment. There have been moments where we have had to learn from our mistakes (such is life), but there have been more highlights than lowlights without a doubt. I can’t wait to share more of them with you this year as we celebrate, too! If you can’t wait to hear the rest of our story until my next article comes out or you want to learn about the programs that now call that original building home (and our other programs, too)… call 765-457-8273 or email tbowers@bonavista.org to schedule a tour with Community Education Coordinator Troy Bowers! Hey, friends! We need some help! Who do you know that might be willing to donate ANY of the following items for our AIM program: Rotary cutter for fabric, fabric cutting board, T-pins or a scissor sharpener? Sound random? It’s really not! Participants in our AIM program make blankets to sell in our gift stores. It’s how they make their living! If you know anyone or you have connections in the craft industry… please let us know! Did I really think someone our in cyberspace would chime in and say, “Yes! I know the owner of JoAnn Fabrics and I’ll contact them on your behalf?” No. Was I hoping that someone would say, “Hey! I used to do a lot of crafts that used that equipment, but I don’t anymore. Would you like my hand-me-downs?” Yes. As a non-profit we often just take whatever we can get. If it’s new… that’s a bonus. Most of the time, though, it’s not. I was super excited. Every little bit helps, and even if this person had leftover yarn, fleece or anything that might aid in the creativity of the people we serve… I was going to be pleasantly surprised. I gave the woman our address, and told her she was welcome to drop the items off at her leisure. Imagine my surprise when the next day I received this inbox message: Hey no problem! Super glad we can help. I ordered them off line and had them shipped to that address. They should be there on Tuesday in an Amazon box!!! 😀. I know that social media can get a bad reputation. It’s a time waster. It causes too many arguments. It keeps you from doing physical activity. The list could go on. And, believe me, I’ve heard them all. Here’s what I will say: some times it can be wonderful! We would have never made this connection or had the turnaround time on an answer using any other platform to distribute information. I could have put an ad for it in the newspaper (would have cost us money and taken more time). I could have recorded a radio commercial (but, not everyone listens to the same station and, again, money owed). I could have posted a sign outside of our building (and hoped that a crafty or generous person drove by). Nothing has as quick of a return at social media. With all of that being said, regardless of what you think of social media and its impact on society, it’s impact on our organization by just one person — HUGE! Until next time… keep a good view on life. I’ve talked a lot about our community partners. The businesses and volunteers who come in, make a difference and leave us a better organization than the way they found us. Some businesses, though, support us year-round by employing adults in our WorkForce Diversity program. You may be thinking, “Big deal.” But, it is! Bona Vista’s WFD program has been providing career placement services for more than 40 years. Thanks, in part, to businesses like Walgreens, Goodwill, Subway, Walmart, Meijer and the YMCA (just for example) who have been business partners of ours for a while. They are looking for friendly, smiling faces who have a foundational knowledge of customer service and who have an incredible work ethic. The current, qualified WFD staff is made up of Indiana University-certified Employment Specialists. The staff knows the local job climate and participate in local and state activities that relate to employment and the economy. In other words, they have skills that can help your business pay your bills. And, who doesn’t want that?! Persons served through the WFD program participate in job readiness classes, internships and other specific training programs. These trainings ensure that the persons served are prepared for employment when they start a job, which is really beneficial to employers. In addition to being prepared for the specific job, they have also gained a tremendous amount of self-confidence through their training. They are EXCITED to work. They WANT to work. If you think about some of your current employees, how many could you say that about? The staff works with employers who need pre-screened and dependable job candidates; job seekers and career changers; high school students and recent graduates searching for vocational direction; and people who are determined eligible for services through Indiana Vocational Rehabilitation Services (Voc Rehab). Do you need a more specific example? There are hundreds over the years I could tell you about, but here is one more recent. 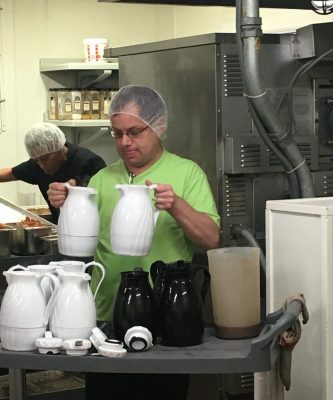 Andrew S. is an outgoing, friendly individual in the WFD program who wanted community employment. He went to one business to see about employment. They let him try it out for several days to see if he would be able to do it on his own. Unfortunately, between Andrew and his employment specialist, they decided that the computer entry work would be a little too challenging for Andrew to do without supervision. So, they moved on. The next week he went to a different business to do the same “type” of work, but without the computer aspect that he struggled with previously. This next business was the PERFECT fit for Andrew. He is now working several days a week, is loved by the staff and is excited to have this renewed sense of independence and confidence. Andrew, and many others like him, are the reason this program exists. Andrew wanted to work. Andrew is willing to try new things. Andrew can do many things on his own after a little bit of training. Andrew is a loyal and dedicated employee of a business who was in need. Andrew now has a steady income and increased independence. Andrew will now talk to anyone and everyone who will listen about his place of employment and the hard work his Bona Vista employment specialist put in to make that connection happen. I have a hard time seeing how this is NOT be a win-win. Persons served have a wide range of abilities, and live in Indiana throughout Tipton, Fulton, Howard, Miami, Cass, Carroll, Pulaski, Hamilton, Madison, Grant, Wabash, Clinton and White counties. 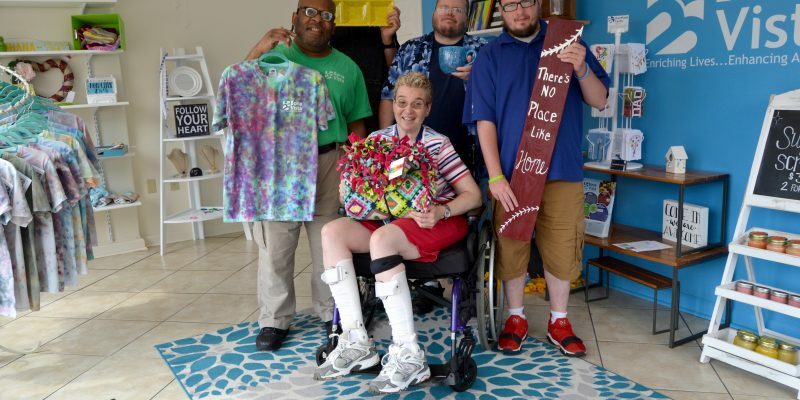 These individuals may have developmental or intellectual disabilities, but work tirelessly with our employment specialists to find a successful placement. The list of partnering business continues to grow, and we couldn’t be more appreciative (more than 30 in Howard County alone!). However, we are always looking for more! The more options we have to match persons served up with the job of their dreams… the better! We don’t want to place someone at a fast food restaurant if what they really want to do is push carts or greet the door at a large retailer. We want to make sure our matches are a perfect fit for both the employer and the employee! We are going to start highlighting some of these amazing businesses on our Facebook pages (@bonavistaprogramsinc & @bvjobs) so you can get a better look at how the partnerships work. 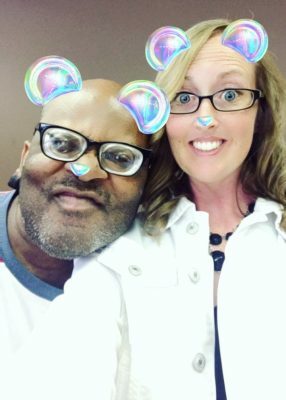 However, if you’d be interested in seeing how we can partner with your business, call Vice President of Vocational and Day Services Meredith Freeman at 765-454-5997. 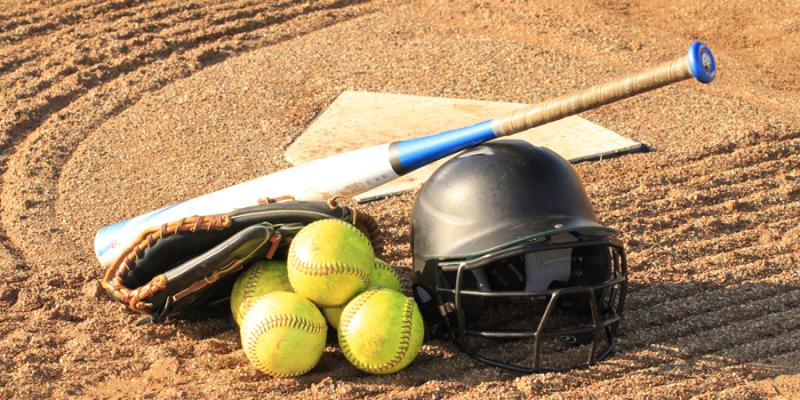 Take me out to the ballgame… for a good cause! Take me out to the ball game, Take me out with the crowd, Buy me some peanuts and crackerjacks… That’s right, it’s baseball season! I don’t know about you, but at our house that’s a pretty exciting time. My husband has played baseball and slow pitch softball as long as he’s been able to walk, and so, naturally, our daughters have grown up at the ballpark. Whether it’s taking in an Indianapolis Indians game, a road trip to watch the Chicago Cubs or locally at Northwest Park. We are no strangers to brick dust and ballpark food. So, when the City of Kokomo announced a couple of years ago that the KokomoJackrabbits Prospect League team was coming to town, we were pretty excited. We spent so many nights at Kokomo Municipal Stadium the first year we decided to become season ticket holders the second season. It’s true. We are right next to the home team dugout so we can interact with the players and coaches, and we have no regrets (although if I could get a cup holder on the cement wall for our front row seats, I wouldn’t complain). Special shout out to our seat mates – Scotty & Leon – because the ballpark is also about meeting new people, and enjoying life together. I digress. Have you been to a game at Municipal Stadium? If so, you already know how amazing the facility and atmosphere are. If not, what are you waiting for? If it’s a personal invitation, then consider this article your personal invitation from me for opening night on Tuesday, May 30. No, I won’t be paying for all of your tickets. But, what I will do is offer you an opportunity to support Bona Vista Programs while also having a great time! 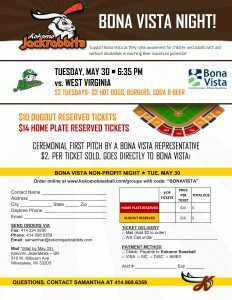 Opening night for the Kokomo Jackrabbits is Tuesday, May 30, which also happens to be non-profit night featuring Bona Vista Programs. What do you need to do to help? I’m glad you asked! All you have to do is go online to kokomobaseball.com/groups to order your tickets. When it asks for the code, type in BONAVISTA. Buy as many tickets as you’d like – one for yourself, your significant other, your kids, your kids’ friends, your neighbors, co-workers, mailman, hairstylist – there is no limit! Reserved seats are $10 or $14 (depending on where you’d like to sit), and $2 per ticket sold goes directly back to Bona Vista Programs and the people we serve! If you’re not comfortable buying tickets online, you can call Samantha at 414-908-6359 and tell her you want to help us out! She can take your order over the phone, and is super friendly! Oh, you could even purchase tickets to donate to groups of kids and adults who may not be able to afford it! The possibilities are endless for ways to support Bona Vista that night. Need additional incentive? Tuesdays are “$2 Tuesdays” at Kokomo Municipal Stadium, which means you can purchase $2 hotdogs, burgers, soda & beer. So, after you buy tickets for everyone you know (or talk them in to joining you and buying their own tickets), you can even eat dinner for cheap. No need to worry what’s for dinner that night because we have you covered – ballpark food! We can’t thank the Kokomo community enough for all it does to support Bona Vista, our programs and the people we serve. We couldn’t do it without your generosity. We hope you’ll come out to the game at 6:30pm on Tuesday, May 30 to shout out when they announce that we are the non-profit of the night, but also to enjoy yourselves and take the opportunity to sit back and reflect on all you do to help those in need in this community. We appreciate you, and can’t wait to see you there! Miss Amazing is more than just a title! If you have ever met Sommer Kitts, what I’m about to tell you will come as little to no surprise. And, if you’ve been on Bona Vista’s social media in the past couple of weeks, you already know part of this story. She is the QUEEN! That’s right. She took her outgoing personality to the stage, and won the title of Miss Amazing Junior Miss in Lafayette a couple of weekends ago. Now, if you think that title sounds made up because I think she’s amazing… you’re wrong. She has the tiara and sash to prove it! The Miss Amazing pageant hopes to break down barriers for females with disabilities. According to their organization’s web site, “Research shows that girls and women with disabilities regularly face a harmful ‘double-dose’ of stereotypes associated with two parts of their identity: being female and having a disability. I could not agree more. I’ve tried to introduce you to some of my friends with different abilities in previous articles. I think it’s pretty easy to see that if they didn’t have opportunities like this, our community would be missing out! If you don’t remember hearing about any of my friends, you need to go back and re-read. Alas, I digress. If you have never met Sommer, you are in for a treat! Here’s a very brief background: She is 20 years old, works at the YMCA two mornings a week as a greeter and participates at Bona Vista in the AIM program two days a week. She is totally boy crazy, will dance anywhere or anytime (ballet, Zumba, hip hop or anything else you come up with), enjoys coloring, is obsessed with Elvis, and loves her dog and her mom, Beth (not in that order… most days). She’s on the Mayor’s Advisory Council for Disability Issues (shout out to the Mayor. He’s a member of Sommer’s fan club!). Oh, and she has Down Syndrome. You didn’t think I’d really mention that first, did you? Good. It’s about the last thing to know when getting to know Sommer. Sommer decided to do the pageant because “It doesn’t matter what color we are or what disability we have, we are all beautiful on the inside.” And, if you think she came up with that answer for the interview portion of the pageant, you are mistaken. During that portion, she told the judges how boy crazy she is, how she’s single and ready to mingle and that she is a huge fan of Elvis. What you see is what you get with Sommer. She doesn’t care if you’re the waiter at a restaurant, the Mayor of the town she lives in or a judge in a pageant she wants to win, she’s going to treat you the same and tell you ALL of the information she knows at the time. She doesn’t know a stranger – a girl after my own heart! The interview portion of the event took place during hair and makeup. The talent portion of the competition came next. I mentioned earlier how much Sommer likes to dance, so you can imagine what she chose for her talent – dance. And, girl got down! Literally. She did the splits at the end! There is video, which obviously I can’t show you in the newspaper so you’ll just have to trust me… she did awesome! And win she did! With her victory comes a shot at the National title in August during a competition that will take place in Chicago. She’s not sure what the adventure will hold, but she is ready! “I’m already planning my talent song, working on getting sponsors and doing good things while I’m Miss Amazing Junior Miss,” she said. That last part won’t be hard, though. To know Sommer is to love her. So, does she have any haters? “I have so many people who love me, that if people don’t like me because they don’t really know me… it doesn’t really matter,” she said. “I’m confident, and I like being me.” Don’t we all wish we were as confident? I’m pretty sure we could learn some valuable lessons from The Queen. Greatest Spectacle in Racing isn’t the only May event worth attending! If you’ve grown up in Indiana, the month of May more than likely generates memories of the Indianapolis 500. Whether you’ve gone to the race for years or never been, whether you’ve watched it on TV or only listened on the radio, whether you’ve had family gatherings in celebration or if you take friendly bets on the winner… I can almost guarantee you have at least one Indy 500 memory. This will be my first May at Bona Vista Programs. And, luckily, I knew going in to the job that May is a big month around here as well. It seems like I say that every month, right? Now you’re catching on. However, if you’ve never experienced Soupley’s Wine & Spirits Greatest Spectacle in Tasting event, then I’m not sure you’ve fully experienced Indiana in May. Let me just say that the Greatest Spectacle in Racing isn’t the only game in town, folks. This year marks the 23rd annual for the event, which features hundreds of fine wines and microbrews, samples of food from around the area, silent auction items in abundance and live music. If you’ve never been or you just turned 21 and this is your first chance to go, let me tell you a little about how the evening works. Grab some friends or family, save the date (May 20), get a babysitter (if applicable) and find a designated driver. You could even buy your designated driver a ticket, if you’re feeling generous, for their sacrifice… although there will be plenty for them to drink that night as well – Coca-Cola, smoothies, juices, coffee, water, etc. Purchase your tickets in advance (bonavista.org or any Soupley’s or Bona Vista location) – this will save you $10 per ticket at the door and precious time standing in line. Show up to Bona Vista, 1220 E. Laguna St., on Saturday, May 20 at 6p with your ID in hand – Disclaimer: Must be 21 years of age to attend. And, yes, we check all IDs. So, don’t be offended if we don’t take your gray hair as a sign you’re 21… we are going to check anyway. Consider it a compliment! Get a program booklet from one of our friendly volunteers, and develop your strategy. Not a planner? That’s ok. Grab a booklet just in case you find a beverage you like, and want to make a note so you don’t forget (and so you can purchase them later at Soupley’s). Want to wing it? Skip step 6. With three tents of beverages, food and silent auction items it would be easy to get overwhelmed… don’t! Inside your program booklet, we list every restaurant and vendor inside the tents. Pro tip: Don’t start at Booth 1 (but be sure not to miss it, either). Start at the back and work your way up. If everyone starts at Booth 1, it gets backed up – and, again, precious time. As you look through your program, you’ll also notice the listing of all of the silent auction items up for bid. There will be hundreds, so there will definitely be something for you. That means, you need to stop by the Silent Auction Bid Sign-In table. There, volunteers will get your information and give you a number. Pro tip: Remember this number. If you forget it, and you write down someone else’s number… you won’t be going home with your items. That will make for a sad evening, and we are all about happiness! So, head out on your way. Be sure to drink responsibly (so you remember the evening and can tell any of your friends who didn’t come all about it for next year). Even though you have a designated driver (See Step 1), they don’t want a mess in their car, so pace yourself. Be sure to try all of the new releases, though (and, again, make note so you can pick them up the Monday after the event at Soupley’s)! Bid on silent auction items during the night, and be sure to check on them a few times (and always make sure you’re using the right number). People will out bid you, so you’ll need to keep an eye on your items. You won’t want someone else getting them… trust me! At the end of the evening, when you’ve won a few silent auction items and have eaten as much as you can handle, you’ll get in your designated driver’s vehicle (or call a cab) and drive away slowly into the sunset. I think that just about does it. Now, in the weeks leading up to the event I’ll tell you all about the amazing restaurants and what tasty items they will be bringing, the band that will be performing, the beverages you’ll have the opportunity to sample, the quality silent auction items… even down to the decorations! Oh, and some of these you may see on our social media first! So make sure you follow us on Facebook (Bonavista Programs), Twitter (@BonaVista_) & Instagram (@bonavistaprograms)! Reminder: Get your tickets in advance at any Soupley’s Wine & Spirits location, any Bona Vista Programs location or online at bonavista.org! When I sat down to write this blog, I wasn’t exactly sure what direction it was going to take. Do I talk about a program we offer? Do I tell you about more of the amazing people we serve? How about something on some of our great staff? Or about upcoming events (P.S. Mark your calendars for May 20 – Soupley’s Greatest Spectacle in Tasting)? There are always so many things going on at Bona Vista Programs that it gets difficult to narrow it down. So, what did I decide? Well, let me just tell you – a little bit of all of it. And, you want to know why? Because it’s all rolled in to one! We only have wonderful programs because there are people who need served by our amazing staff who also volunteer at our annual events! Bet you didn’t see that one coming! But, it’s true! People tell me often that we do great work at Bona Vista, that the work we do is important to the community, and that they are thankful for our organization. I totally agree with all of those statements (obviously!). But, doing good work can come at a price. It can be exhausting (that’s the behind-the-scenes grunt work you don’t see)! As with any job, there are trying days. Those days when you’re not sure if the work you’re doing is making a difference. The days when you’re so exhausted from running here, there and everywhere that you’re not sure you even accomplished anything. You know… those days when you think you’ve had just about all you can handle, and you have to go home and take a nap to recover. Yep! Those days even happen at Bona Vista (although I like to believe they are pretty few and far between). So, cheers to you… Bona Vista Programs staff! I appreciate you. The people we serve appreciate you. The parents of the kiddos in our early childhood programs appreciate you. The community appreciates you. If you’ve ever met me in person, I’ve probably told you how much I appreciate you. I try to make a point of it because I know how difficult your jobs can be at times. But, I truly do mean it! I see you on your good days when you’re smiling, and everything is as it should be. I see you on your rough days as you’re (literally) running or consoling or just trying to keep it together until your shift is over. But, I also see the adults and children we serve. I see their smiles. I see them learn new things. I see their creativity become reality. I see them encouraging each other (and you). I see them thriving with purpose. I see them loving well. And, that’s all because of you. Each and every staff member (all 500+ of us) play an important, distinct and vital role in this organization. When one piece of the puzzle is missing, it’s not complete. We couldn’t do what we do without you! So, don’t think for a second that the work you are doing goes un-noticed or un-appreciated. We notice, and we appreciate it! You might be thinking, “Is it employee appreciation month? A special holiday that recognizes staff?” No. When I think about our staff, though, I can’t help but swell with pride. We have staff members on the job 24 hours a day, 7 days a week, 365 days a year. Did you know that? Some of our office locations may only be open during the day, but having group homes means that some of our staff work nights, weekends and holidays. It’s not easy work, but they do it so well! Even our administration staff (who don’t provide direct care) have such a deep love for the organization because they know the impact it has on the lives of those we serve that they volunteer for our events, and offer to help when off the clock. It just tugs at the heartstrings! Now, I could gush on and on all day about how amazing our staff is. And, if you want to take me to lunch some time I’d be happy to do that (joking!). 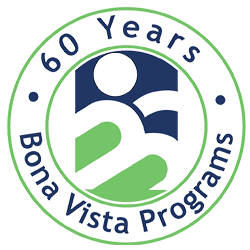 For now, though, I’ll just say that if you see someone with a Bona Vista badge on… thank them, tell them you appreciate them or just give them a high five! They deserve it! I wasn’t going to have any kind of ask at the end of this article because it really was just a love fest. Then, I decided that I didn’t want to take that opportunity away from someone. So, if you’d like to join our staff, visit bonavista.org & click on Career/Volunteer. There is a list of available opportunities for you to look over, and apply for. We would love to have you. If you’re not handy with a computer, you can call 765-457-8273 and talk to someone in Human Resources or stop by 1220 E. Laguna and they can walk you through looking at the descriptions online. Truly, though, when you work for Bona Vista Programs you’re a part of something bigger than yourself. Between staff and persons served, you become a part of one of the largest families in Howard County. And, I love and appreciate my family. Whew! It’s April! Can you believe it? I mentioned in my article last week that April is Autism Awareness Month. However, I want to take this week to re-cap the awesomeness that was March Disability Awareness Month. Next week, I’ll introduce you to some of my friends from Bona Vista who happen to have Autism, but you’ll just have to wait in suspense until then. 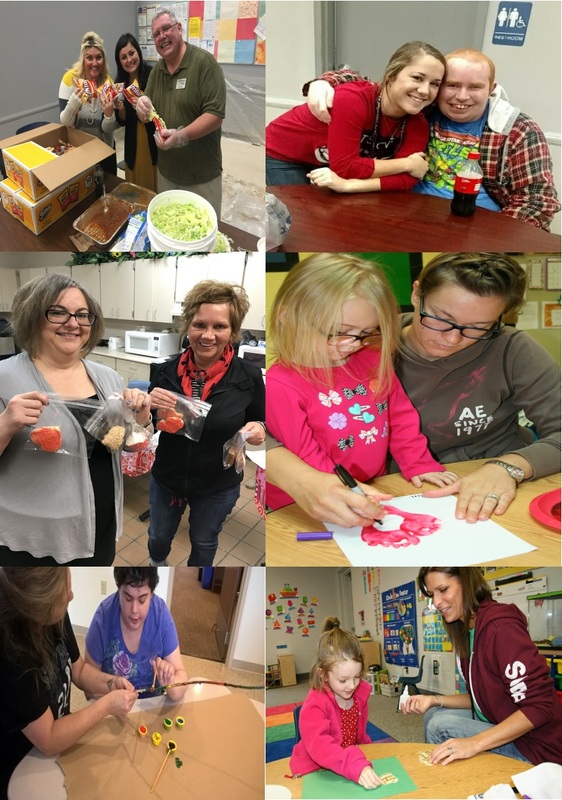 March was a whirlwind of amazing activity at Bona Vista Programs. If you’re friends with us on Facebook or follow us on any other social media, you were able to go along with us on our amazing journeys. From first-time events, to a magic show, special visitors and our annual basketball game. I’m sure there will be things I forget to mention, and I hope people don’t get offended. Know that we appreciated each and every single person who in one way or another advocated on our behalf and spread awareness not only of our organization, but of cultivating a community of inclusion! THANK YOU to everyone who participated in any of our restaurant give back nights. If you came to the magic show or picked up froyo to go from Orange Leaf, if you ate some chips and salsa or had a margarita in our honor from Hacienda, if you watched a game and debated which sauce is best on your wings at Buffalo Wild Wings or if you smashed some peanuts on the floor while devouring some award-winning ribs at Texas Roadhouse, we appreciate you all! THANK YOU to everyone who came out to Superior V on St. Patrick’s Day for our first-ever Viva Las Vista casino night event. The staff at Superior V deserves a huge round of applause for their efforts! Keeping up with unlimited appetizers is no small feat given the number of attendees! The Sertoma Club of Broadripple who brought the casino games, dealers and ambiance with their amazing outfits… bravo! Our media sponsor WWKI who had us on Male Call for weeks, who promoted the event on social media and who took a chance on a first-year event and represented the night of in grand fashion! And, last but not least, all of you who came out to have a little fun, we appreciate you all and hope you have the event marked on your calendar for next year! THANK YOU to officer Kevin Summers who came and spoke to our Preschool about “stranger danger,” and how they should always “check first” with their guardian before talking to anyone they don’t know. To LeaderOne Financial who gifted us $1,000 through their #GIVE1000 program thanks to Kurt & Amanda Koetter. To the Howard County Kitten Rescue, Outdoorsman Bud Fields and all other amazing guest speakers in the Sky is the Limit program this month. Members of the Celebrity team got some solid advice from their assistant coach & Bona Vista Board Member, Chad McCarter, before the game. 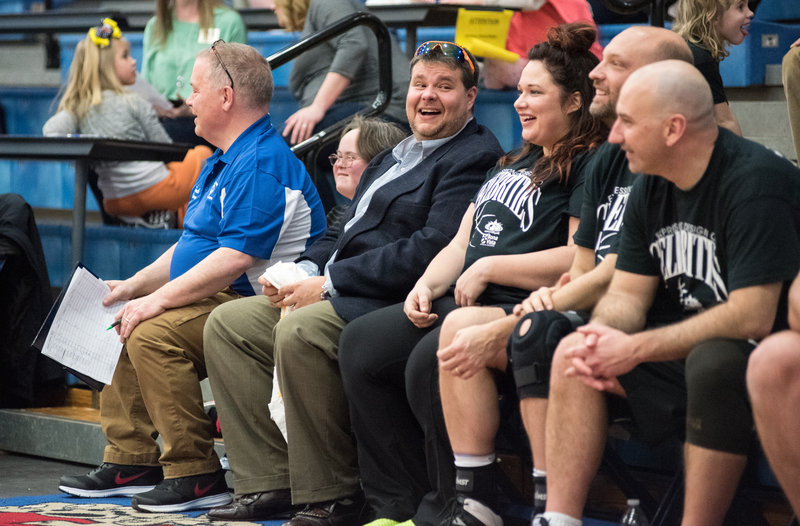 THANK YOU to everyone who sponsored, played, cheered, danced, volunteered or in any other way supported the Disability Awareness Basketball Game. The Bona Vista All-Star team (once again) defeated the celebrity team, but both teams were great sports and we appreciate all of them being willing to play. We were able to raise more than $17,000 with the help of sponsors, celebrity player donations, Coca-Cola’s pop-a-shot half time, concession stand purchases and the donations some of you dropped in the box at the door that night. It wouldn’t be possible without the support of Kokomo School Corporation’s donation of Memorial Gym & their amazing janitorial crew who keeps that place running flawlessly or our media sponsor Z92.5/Rock 98.5/WIOU1350 who worked tirelessly to make sure everyone within ear shot knew about the event whether on the radio or social media! Like I mentioned before, I’m sure I’m missing someone or something that we did last month because it was a whirlwind of amazing activities. We definitely appreciate each and every person who played even the smallest role… although there are no small roles because they are all essential! We hope you were able to participate in one way or another or at least live vicariously through my articles. Your next opportunity to participate in one of our special events will come on Saturday, May 20 when we host The Greatest Spectacle in Tasting, sponsored by Soupley’s Wine & Spirits & Z92.5/Rock 98.5/WIOU1350, on the grounds of Bona Vista, 1220 E. Laguna St. I’ll have several articles about that wonderful event leading up to it, as it’s our largest fundraiser of the year and you will NOT want to miss it! You must be 21+ to participate, so get a babysitter & plan a date – you have plenty of notice! If you have any questions about past or future events, if you’d like to take a tour of our organization to learn more or if you’re a business who would like to sponsor The Greatest Spectacle in Tasting, call me at 765-457-8273 or e-mail me at abrantley@bonavista.org. I’d love to hear from you!